Let’s just clear the air: When you go to SWEAT 1000 in The Heights, you’re not showing up because you want an easy workout. You will not hear your inhale or exhale over the music. You won’t have time to compare yourself to others on the treadill or the mat. But trust us — it’s the most fun you’ll have burning 1,000 calories. And that hour will fly by. So, what is SWEAT 1000? It stands for Specialized Weight Endurance Athletic Training, and the 1000 represents the calories you’ll likely burn. 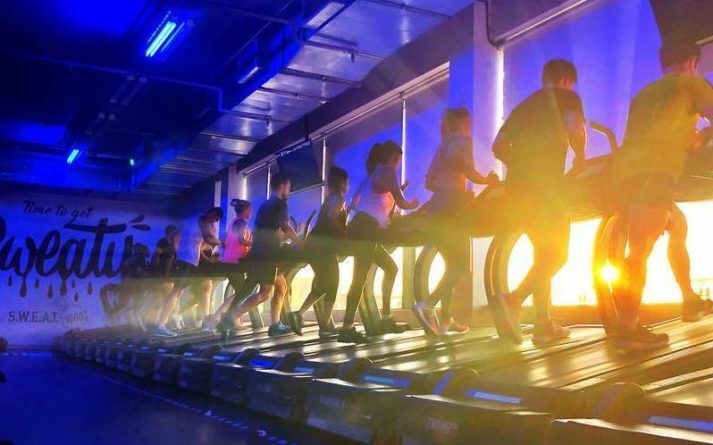 The gym, which celebrated its grand opening in mid-March, debuted in South Africa. The killer workouts caught the attention of Houstonians Jordan Strouse and his wife Ana Barron. When the couple returned to Texas after working in Cape Town, they convinced SWEAT’s founders to allow them to bring the fitness concept to America and it paid off — everyone from local NFL players to couples in their 60s have already shed some sweat! They offer a full-hour, full-body, full-of-sweat workout that mixes treadmills and different apparatus like BOSU balls, boxing bags, decks, TRX, dumbbells, and more. When you walk into the SWEAT studio, you’ll select one of their 30 Freemotion incline treadmills. Each one has a motivational word on the back, like Inspire. Rise. Power. Strong. Courage. Push. Remember those motivation words when the intervals start. A new speed or incline will be shouted out or you’ll be off the treadmill and onto the floor to lunge, knock out some mountain climbers, or lift neon-colored dumbbells (offered in four weights). With bumpin’ music and high heart rates, it’s like Barry’s Bootcamp… but at almost half the price. So you crush your workout — now, it’s time for a pick-me-up. SWEAT has that covered too. There is a free donation-based coffee stand with drip coffee, as well as a coffee bar and smoothie bar complete with nitrogen coffee and smoothies for $5 or $6. Owner Jordan Strouse understands you have a job to get to or come from. He does too. So he’s building an experience to give you a workout, plenty of room in the locker room to get ready before/after work, and the fuel to get you through your work day or back home. Plus, all of those donations for the coffee stand? 100% will go to a charity, like H-town’s own Homemade Hope, which teaches children life skills. So, that way you can be strong, rise to your goals, and inspire others, all with a little bit of SWEAT.